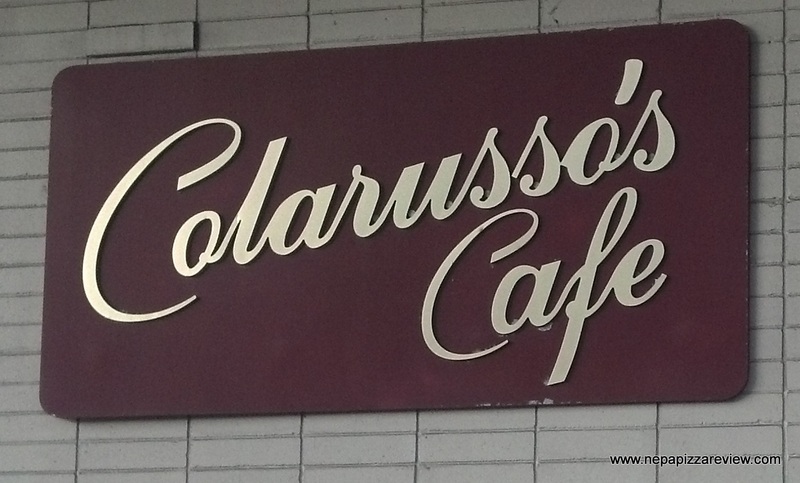 Ok so I've noticed that buying an entire pizza, or half tray of pizza every time I want to make a blog post can get a bit costly, so I decided to go for some value today and visit the famed Colarusso's lunch buffet and review 2 pizzas for the unlimited price of $10.95. If you've never been there, you owe it to yourself to take a day off and head up to Clarks Summit, it's top notch. Included in the buffet is a variety of pizzas. Today, I'll be sticking to old forge red, and old forge white pizzas. 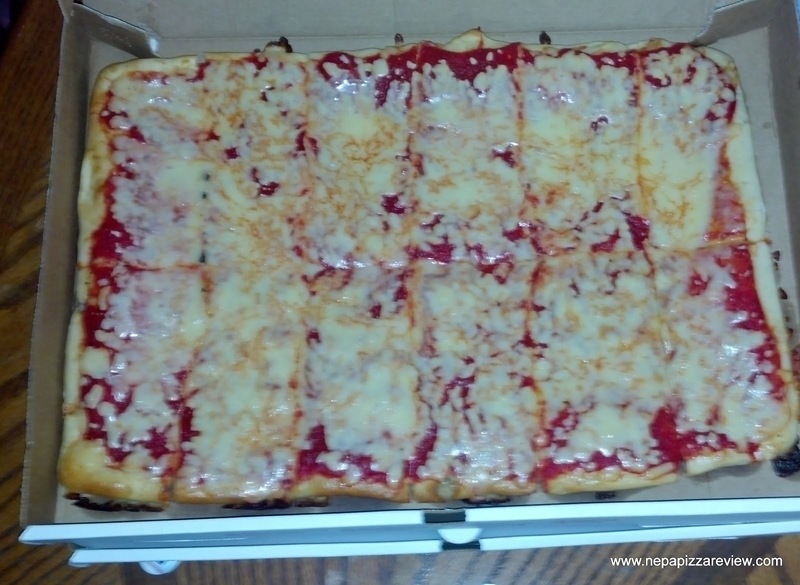 First on the list is the standard old-forge style plain pizza. Although I could probably review this pizza from memory, because it's been so consistent every time I've had it, I had to give it an objective try. The familiar looking pie was again cooked to perfection, prepared perfectly, and just ready for me to consume rapidly. When I bit into the pie, the first thing that grabbed me was the sauce. 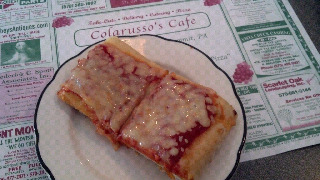 I'm a sauce guy, so this is why Colarusso's is among my favorite old forge pizzas. The sauce is more flavorful than most old forge pizzas, with a certain mild sweetness and light pepper and herbs also coming through. The cheese became a bit muted because of the sauce winning the battle for flavor supremacy. Finally, the crust was beyond good. I don't know how the place does it, but it seems like the pizza stays crispy forever. You know how when you drop a McDonald's french fry under your car seat and find it 3 months later and it looks exactly the same as when it came out of the fryer??? That's how the Colarusso's crust is (in a good way!). I've literally refridgerated a CC pizza overnight and bit into it cold the next morning, and it's still crunchy, that just doesn't happen with most other pizzas. Now, I'm not the biggest fan of white pizza, but I can certainly appreciate why some people do enjoy a pizza without sauce. I grabbed 2 slices of white from the buffet (ya know, just in case I wasn't sure about the first!) to try. 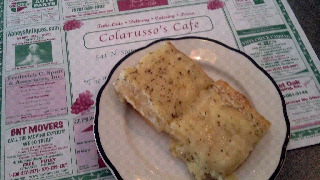 I found the signature Colarusso's crust to be very tasty, crispy, and a nice complement to the flavorful cheese and spice variety. I couldn't identify the cheese blend, but I did enjoy the parmesan sprinkled over the top and melted into the mixture. It really added a ton of flavor. The garlic and italian seasoning also packed a punch without overpowering the light flavors of the dough and cheese. Bottom line. For the price, there is no better lunch buffet around. Getting a variety of pizza of this quality is just an added bonus. One might think that a pizza sitting under a heat lamp would get soggy or dry over time, but this isn't the case here. 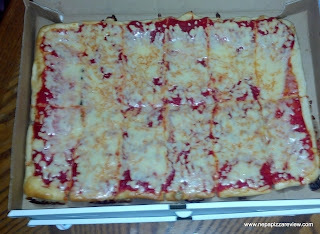 When I create a pizza hall of fame, Colarusso's old forge style red will certainly be inducted! Just an update to the above post. Someone brought a Colarusso's tomato and garlic pizza in to share for lunch last week and it was incredible. 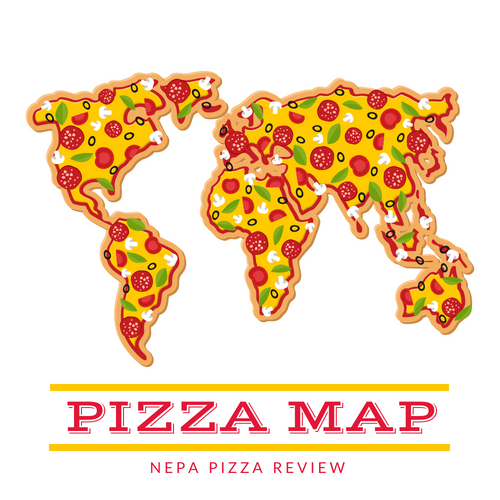 I HIGHLY recommend this pizza if you are ever in Clarks Summit, and I have many friends and family who would agree! Another update. I grabbed 2 pizzas to go - one plain, one with sausage and pepperoni and both were amazing. $30 for both pizzas was a little steep, but worth the price of admission for the quality of the pie!